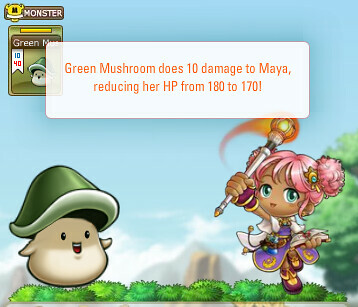 I blogged about the beta of Maple Story's iTCG recently. At the time, the beta servers were down. Since then, I've gotten a chance to play the tutorial and knock out a few games online. While not a perfect overall package, the iTCG puts the browser-based platform to good use and introduces a refreshing new game. I would describe the basic mechanic of the iTCG as "choice". Every card has two parts: type and skill. Card type's include characters, monsters, items, and tactics. Skills are separate from the card type and are used in conjunction with the character card (Thief, Warrior, Mage, or Bowman). There is only a single character card per deck and this defines the basic skills that players start the game with. The first part of a turn is "leveling up", which involves choosing a card to play from your hand. During level up, the skill on that card is added to your character. That skill is then available for use if the criteria is met. If a card is used to level up, you gain the skill associated with the card for the rest of the game, but the card is then no longer playable as it is permanently attached to your character as a skill. If a player chooses to level up, their character gains +10 levels. Leveling can be skipped, allowing players to avoid losing a card they may want to play. Each skill, monster, and tactic has a level requirement. 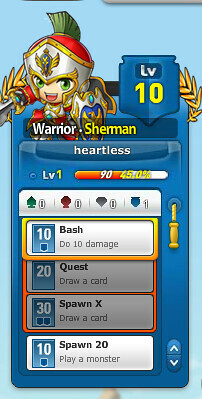 The level requirement must be met through character level or skill before the card or skill can be used. Some skills allow higher level cards to be played. To make the choices even more interesting, skills have a color requirement. Each skill is of a certain color and requires other skills of the same color above or below it in a character's skill list. A level 70 skill with two black down arrows requires two black skills below it. If the color requirement is not met, the skill can't be used. This prevents the use of decks that use the best skills of each color. Multi-colored decks can work, but take careful planning. Skills do something immediately or allow a player to play the rest of the card types: tactics, monsters, and items. There are also "one shot" skills, which are usable only on the turn they are played. Normal skills are free to use every turn if the requirements are met. After several turns, the stack of skills available can get quite large. Item, tactic, and monster cards are straight forward. They can only be played on your turn as the result of a skill or card trigger. Items are attached to your character and have a passive effect on the game or in the case of weapons, can be used against your oppenent. Tactics are immediate effects on the game. Monsters are "spawned" and then can be used to attack. Monsters also serve as a defense for your character. For every monster in play, your character takes -10 damage from enemy monster attacks. Monsters can be targeted and killed. The hardest part of the game for a new player is understanding the flow of skills and leveling up with the correct cards. My suggestion here is to play slowly at first and think about when and how a card can be used. If the skill has a level 70 and two blue requirement, its probably best saved for the mid-game. It won't be usable right away, but it has to be played early enough to get two blue skills underneath it (to meet the skill requirement of two blues). The objective of the game is to reduce your opponent to zero life. Players can leave games when they know they will lose, preventing them from taking a loss on their record. I currently have 0 wins and 7 losses, but I've played over a dozen games. Every game I've won, the other player left early preventing me from getting a win. This has to be fixed or it will ruin the game. If a player loses and does not return within 60 seconds, they should receive a loss. Server stability was rocky the first day. I continually was disconnected from the tutorial, forcing me to restart it repeatedly to learn the game mechanics. Since then, I've had no issues. A few cards feel way too powerful. For example Energy Bolt is easily played and deals 80 direct damage. Overall, most direct damage skills and abilities are over the top IMHO. The more games I played, the more I felt as though the Thief and Warrior decks were completely unplayable against Mage or Bowman stacked decks. Without a computer to track everything, this would become an unwieldy card game to play. The way skills works demands a computer referee. That is why I stated that the Maple Story iTCG takes good advantage it's platform. The game is browser-based and requires only flash. Click the link and you can play on 95% of the PCs out there. Not a "pure" browser-based game, but flash is a standard of sorts and requires little effort to get running (unlike Quake Live's browser plug-in). The artwork is solid and enjoyable. Again, the iTCG takes advantage of being on a computer and offers great visual animation for attacks, monsters, and when playing a card.